Welcome to the latest blog traffic and income report for Smart Money, Simple Life; where you’ll learn about my efforts to create a semi-passive income via a self-hosted blog. Whether you’re old or young, blogging is a great way to build a side income that might one day either become a full-time endeavour or fund your comfortable retirement. Not only is blogging a great way to build a business or just make some money on the side, it’s a great way to share your knowledge and ideas with other’s who might benefit from it. I know I’ve learned a lot from various blogs over the years and I hope the information and ideas I share here, in turn, help others. My only blogging regret? Not starting sooner! Don’t be like me, start now! Bluehost has a great hosting deal to get you started that includes a free domain name. Smart Money, Simple Life is still just a part-time hustle as I have, among other things, an Etsy business to run and I’ve just returned to full-time study (that’s a story for another day!) so time and energy are sometimes in short supply. Despite only having limited time to devote to blogging, I still make a tidy little sum each month and I’ve only just begun to monetise my blog. If I can do it, you can, too. Read on for an update of Smart Money, Simple Life’s stats for July. Page views peeked back over the 100,000 level again which was delightful to see. Apparently, the northern summer is the slow time of year for blogging so this nice little bump in traffic was unexpected. I’d like to think it was something I did during the month, but from my side of the keyboard, it was business as usual. Google Adsense is still my primary source of revenue and is a great way to create a passive income stream. July, I hope, has seen the last of the seriously distracting events of which this year seems to have an abundance. So, I intend to put some serious effort into expanding my earning potential via this blog over the coming months. Affiliate sales are one of the ways I create income on my blog. When you make a purchase after clicking on an affiliate link, I’ll get a small commission on your purchase but you don’t pay any extra. The main affiliate links I promote are Bluehost and Book Depository but I’ll be adding more over the next few months. Bluehost hosts my own blog and I’ve always been very happy with their service. (You can find out how to get a special deal on hosting your blog and your free domain name here). BookDepository is my absolute favourite place to buy books. Great prices plus free shipping to just about anywhere in the world. I’ve been a dedicated fan for many years and have made many (probably TOO many) purchases through them. Their service is always five star. You’ll notice I don’t include any freelance or business income in my Blog Income Report. I prefer to focus on revenue generated by the blog itself because my ultimate goal is to build a platform that enables me to earn semi-passive (and some passive if I can manage it) income. Launching my next blogging project. Whether you’ve just got your first job or you’re staring retirement in the face, you need more than one income stream. If you’re reliant on a job for your livelihood, you’re putting all your income eggs in one basket, and that’s risky. If you haven’t already, start looking for ways of making extra money, not just to help with paying down debt and ramping up your savings but also to ensure you always have money finding its way into your bank account each month. For the last 10 years or so, I’ve been making extra money by running an online business. It’s great but it requires a considerable input of time and energy. The income I make isn’t anywhere near passive. And, passive income is where it’s at! Smart Money, Simple Life has been live for about 18 months now and even though I’m not making six figures a month (yet 🙂 ) like some blogs, I make a nice amount of semi-passive income each month. 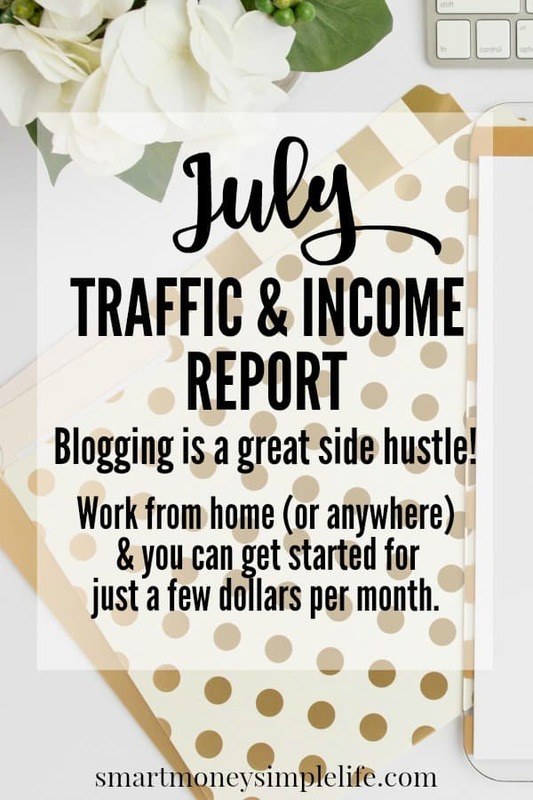 I hope sharing my income and traffic reports provides some inspiration for those of you aspiring to make extra money via a blog you write now, or one you plan to publish in the future. As always, awesome job on the blog! I’ve been super busy and distracted, too and am always so impressed with how you keep everything going during these crazy times! 2016 seems to be the year for ‘crazy’. How do you make AdSense work for you? I’ve been using it for a few years and never make more than 1-5 cents a day! Is it solely based on your traffic? Or do you have a specific ad strategy? Thanks! My only suggestion would be to try placing ads in different spots and then check the performance report in Google Adsense.